Queen City Rowing Club is a sculling competitive program. QCRC has grown to 40 scullers in the last 3 years. QCRC scullers are one of the top power houses in the Midwest Region. Our rowers come from all public and private high schools in the City of Cincinnati. QCRC also has an adult program. Our goal is to make rowing available to everybody and empower individuals to develop strength, teamwork, and character through the sport of rowing. Queen City Rowing Club is part of Queen City Watersports Center, Inc, a Non-Profit 501 C-3 organization dedicated to the promotion of rowing for all communities including Adult, Youth, Veterans, Inner City Youth, and Adaptive. Come compete this fall in exciting sculling and sweep racing for Youth, Collegiate, and Masters categories! Race against competitive crews on a world-class, well-buoyed course that offers great views for spectators. Register below on RegattaCentral, Learn More for additional information, or Book a Hotel with special reduced rates for the regatta. QCRC is a club dedicated to promoting rowing and wellness to the community. We strive to foster an environment where everybody has the chance to improve their lives and self-confidence. Sculling and sweep rowing available. 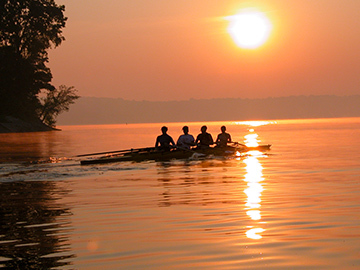 QCRC now offers youth competitive rowing programs for ages 12–18 at two locations. East Fork Lake in Clermont County and in the City of Cincinnati. We create an environment that is respectful, competitive, and positive where rowers will develop excellent life skills and self-confidence. For more information for our programs please contact us. QCRC offers challenging indoor rowing sessions for all levels that include rowing specific training, weightlifting, and cardio. These fun classes are aimed to promote personal health, increase fitness, and teach the basics of rowing technique. "Clermont Crew Transfers Operations of East Fork State Park Boathouse to Queen City Rowing Club"